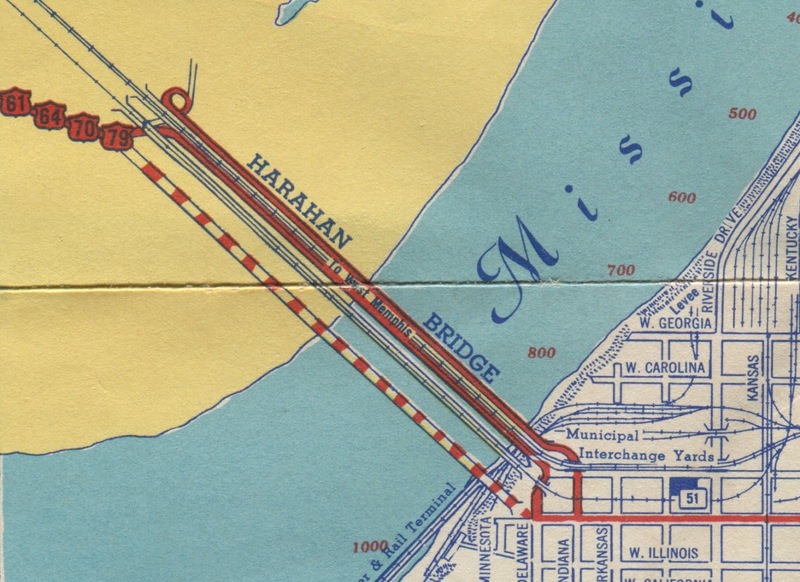 Seems US-64 used to cross the Mississippi River using a railroad bridge and it was called the Hanrahan Bridge to reach Memphis. The approach ramps are still there on the Arkansas side and it seems to be a pedestrian trail now. But the girders and beams which held up the road over the river are still there on both sides. Eastbound on the south side and west bound on the north side. Does anyone know if this was a toll bridge or not? It's actually called the Harahan Bridge. Lots of good info about it can be found online. The Wiki article says it was never a toll bridge. The Big River Crossing website has lots of history on the Harahan Bridge (which is still an active rail bridge) and the pedestrian trail that now crosses where the westbound roadway once was located. ^ Have they completed that bike/ped trail? Last I heard, it was planned but not built yet. Yes, has been done for over a year. Thanks, yes I did find a wealth of info. There is a good backstory here. The Mayor of Memphis made the Rock Island put those "wagon ways" on each side of the bridge. When the Rock opened it they declared the wagon ways "free to all" and to be owned by Memphis and Carruthers County Arkansas. An odd concession in 1916. My 91 year old father , a native Memphian, used to tell stories of how the road decks would catch fire from sparks thrown off the locomotives. Apparently, those planks were heavily creosoted. Looks like there was a tight loop to get the roadway off the west end of the bridge. Now there's a tight loop, albeit across the river, to get I-55 traffic on to its 1949 replacement. I guess some things just don't change much! The map shows a ramp, but I'm not certain that was reality, at least for most of the history of vehicular use of the Harahan roadways. The roadways suggest that westbound traffic simply would have had a sharp left turn at the end of the crossing. I wonder if the loop shown on the Esso map was just a temporary feature, made necessary because of the construction of the access to the highway bridge. I certainly don't remember seeing any hint of it from when I grew up down there, before the area was cleaned up for the Crossing, but if you compare the grade of I-55 to the old bridge access road, presumably something had to have been done, and the kudzu and trees present in the 80's would have made finding hints of that extremely difficult. There was no loop there. It was a left turn onto the 2 way ramp. I looked at some historical aerials of the bridge going back to 1944. The auto bridge for US63 was built in 1954. On the Memphis side, the westbound traffic had to go north through the Indiana Street Viaduct to get under the Rock Island tracks. That viaduct has been filled in, but if you go to Martyr's Park and walk around Virginia Place, (which used to be the Municipal Rail Yard) you can still see the concrete used for the viaduct. From the aerials, you can tell the city abandoned the use immediately after the new bridge was built. By 1963 the ramp on the west side was cutoff completely and it appears the supporting roadway was pulled up on the bridge, just the beams were left behind. Going forward it has sat that way for 50+ years.